Pre-selection of Modules and SLAs. Identify suitable candidates and modules where SLAs would be productive. Send potential SLA and module details via the SLA Nomination Form (TBC). Selecting your SLAs. Application Forms will be sent to proposed SLAs. Where applicable, short-listing/ interviews by Module leader/PALteam. Work plan of SLA activities. Prepare SLA work schedule e.g. seminar or lab activities involving SLAs. Training. Normally an initial 2 day training is scheduled for the new academic year. A second training event may be planned to accommodate a shortfall of SLAs in specific modules. CPD events for SLAs are run throughout the year. Meetings. Hold preliminary meetings with SLAs to discuss expectations before they work with students; follow up with regular communication/ meetings. Promote the SLA scheme to students. Include SLA details in module handbooks and website. Make regular announcements to students. SLA introduction. Introduce SLAs to teaching team prior to start of learning weeks and to students at Induction/during first few teaching weeks. Explain the role of SLAs to students right at the start of term, including the fact that SLAs are not teachers. 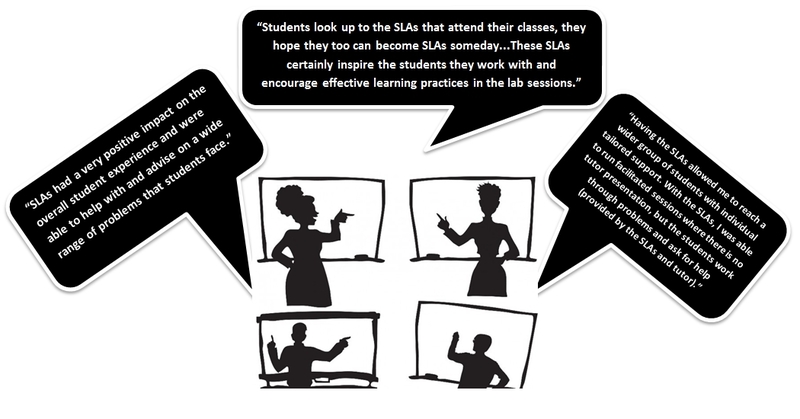 Provide access to relevant learning materials to aid SLA session planning. Encourage feedback from SLAs and view their reflective portfolios on Mahara. Support SLA observations which will be organised by the PAL team. Encourage students to work with SLAs and attend drop-in/ out-of-class sessions where applicable. Hold regular meetings and/or e-mail contact with SLAs. Participate in the evaluation of the SLA Scheme. Must be a current student at Middlesex University whilst working as an SLA. High attendance and punctuality rates in all modules. High grades across all modules or assignments - 2:1 or higher. A positive attitude towards learning and desire to help others succeed. A professional working attitude & sense of commitment. What academic staff have said about their experience?